The Weta Workshop booth was jam packed with fantasy goodness. Fans lookign forward to the Warcraft movie can get a look at the props and costumes being used. Also on display is the always welcome Lord of the Rings and Hobbit collectibles. 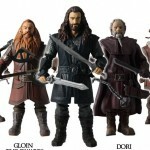 They never disappoint with the breadth of collectibles for Middle Earth fans. They were showing Chappie, Giant Killer Robots and other collectibles as well. • Each figure features 12 points of articulation and replicates the authentic facial features, clothing, weapons and accessories of the character in painstaking detail. • Each collector figure features intricate details replicating the character’s facial features, clothing, weapons and accessories. Bridge Direct has announced the next slate of figures for their line based on The Hobbit.The next waves will be based on The Hobbit: The Desolation of Smaug; The next film in the Peter Jackson directed franchise. There will be both 3.75″ and 6″ figures hitting shelves October 15th. As well as the figures listed below, there will also be a San Diego Comic-Con exclusive figure to be announced at a later date. No photos are yet available.